Fif­teen years ago my ten year old daugh­ter came home with a sto­ry. I burst out laugh­ing. “So who did you think it was?” I asked. I saved her gift-of-a-mis­take in my lit­tle jour­nal and end­ed up unwrap­ping it in a lone­ly hotel room in south­ern Wis­con­sin after a par­tic­u­lar­ly mis­er­able book sign­ing of three peo­ple. I was also lick­ing my wounds from a failed grant attempt of huge pro­por­tions, so the book sign­ing had only added insult to injury. 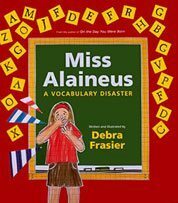 I stayed in my lit­tle hotel room that night and to escape my own life I opened my jour­nal and start­ed to play with mis­cel­la­neous = Miss Alaineus. There is gold in every mis­take. To my aston­ish­ment the Vocab­u­lary Parade is now repli­cat­ed in schools all over the world. I nudged this along with sup­port mate­ri­als in the back mat­ter of the book and at my web­site. Take a look at the slew of inge­nious cos­tumes for words like PARALLEL, or PHASES, or VOLUMINOUS. When I enter a school as the class­rooms are prepar­ing for a Vocab­u­lary Parade I still get goose bumps and teary-eyed. Cre­ativ­i­ty lit­er­al­ly bursts around me like fire­works and the ener­gy in the school lifts the roof ever so slight­ly off its rafters. Par­ents come and line the halls to watch the parade of cos­tumed words, (or like Cedar Lake School, sit in lawn chairs sur­round­ing the school’s out­door walk­way, 400+ par­ents strong after six con­sec­u­tive annu­al events). Kids talk about their cos­tumes and words for weeks before. Pho­tos keep the words alive in the air for weeks after. It is a mirac­u­lous vocab­u­lary enrich­ment event dis­guised as an art project: the BEST kind of learn­ing! Remem­ber: all this grew out of a series of mis­takes! This is my liv­ing proof that it is not “the event” but how we han­dle the event that mat­ters. My daugh­ter could have buried her mis­take instead of laugh­ing with me, I could have drowned my sor­rows that night in Wis­con­sin instead of writ­ing my sighs away, my edi­tor could have joined the doubters…on and on. Fall brings cos­tumed events around the Unit­ed States. Cel­e­brate a Vocab­u­lary Parade in your com­mu­ni­ty and see exact­ly what I mean: the con­ta­gious cre­ativ­i­ty in stu­dents and fam­i­lies will delight and inspire you. Send me a pic­ture of any cos­tumes that makes you smile—that’s the gold I col­lect, year after year. Ah! The fun of a parade! Such a great sto­ry to share! Joanne, thanks for the comment–the Vocab­u­lary Parades are one of the great­est joys of my life, now. Who would have ever thought a mis­take would have such a rip­ple. What a great sto­ry, Debra, and what a great reminder for all of us to think about how we frame the things that go not-as-planned in our lives. You have at least two great lit­er­ary lega­cies: the Vocab­u­lary Parades and the Alpha­bet For­est. What a won­der­ful effect on the world you have had!